There has been an increase in chatter about our health care system recently, The Senate held hearings in February on revising Medicare and there have been several comments in JAMA in this vein. 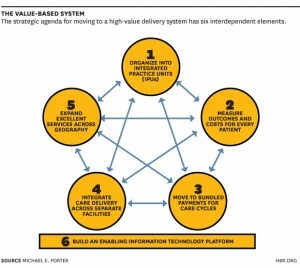 The diagram above represents the solution proposed by Michael Porter and Thomas Lee in the Harvard Business Review under the title of “Why Health Care is Stuck and How to Fix It”. It is a good analysis, with an analytical solution, but we need more than analysis. The following is a letter to JAMA, which they decided not to print, in reference to one of their articles, encouraging, as do Porter and Lee, a total remake of our system. If it tweaks your interest we suggest looking at The Boids and the Bees, where the ideas are fleshed out in greater detail. Drs. Hoffman and Emanuel (1) argue for reworking healthcare because our current system is not working. While their argument looks at the whole of our industry it is still essentially analytical, which is its problem. Reengineering a complex adaptive system is a bit like playing God. If one looks at our healthcare system as the complex adaptive one that it is, then there are many ways to address its weaknesses. Such systems are sensitive to small changes and small changes often have multiplier effects that make them powerful with time. We know now that small changes can flip an ecosystem to a healthier state (2). We can do the same with our healthcare system. Human adaptive systems rely on a marketplace, the time tested way to operate them. Markets need transparency to run fairly, and agents in the marketplace need both information and the financial ability to operate on that information. Aaron Antonovsky looked at people who were hardy in that they did not use the health care system as much as others. Not because they were not sick, but because they were more hardy. He developed a model he called salutogensis (the origins of health). Informed and empowered agents are the basis of Antonovsky’s salutogenic model (3) and are the invisible hand that moves an individual’s health, as well as Adam Smith’s economic model, and indeed any adaptive system, in a positive direction. Promoting correct information and transparency, and empowering agents to use it should be the basis of any change. A clear example of this process, in the wrong direction, is the small change that began third party payment when a group of physicians saw that medical expenses were challenging to many and began an insurance program that evolved into Blue Cross. While it seemed an excellent idea at the time it removed the consumer, a key player in the healthcare marketplace, from his role in that market. Other players, unrestrained by the balance provided by the consumer, have gamed this skewed market to optimize their positions and their profits with the results we see today. Several changes are clear from this perspective. Adding a missing agent flips ecosystems: wolves in Yellowstone and bass in algal lakes. Using Health Savings Accounts to put the consumer back in the marketplace would help flip healthcare. HSA’s inequities could be managed by public underwriting at less expense and abuse than in our current system. HSA’s empower the agent to participate. They are the foundation of the best healthcare system in the world. The other aspect is education. Preventive dentistry is well presented by dental hygienists. Unlike dentists, hygienists have no skin in the game–they do not benefit from tooth decay and so are free to talk about how something as simple as changing your sugar intake to include more xylitol can reduce your tooth decay by as much as 80%. [If this is news to you we suggest looking at our sister site.] Establishing their counterpart in medicine with physician supervision would provide an information source at little cost through the internet. As with all changes to complex adaptive systems these should be done on a small scale and expanded as they are deemed positive. 1 Hoffman A, Emanuel EJ. Reengineering US Health Care. JAMA. 2013; 309(7):661-2. 2 Zimmer C. Ecosystems on the Brink. Scientific American. 2012 Oct; 307(4):60-65. 3 Antonovsky A. Unraveling The Mystery of Health: How People Manage Stress and Stay Well. San Francisco: Jossey-Bass Publishers, 1987.